To gain an understanding of homogenous, heterogenous, and biological catalysts. 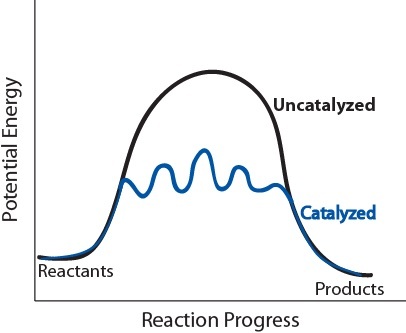 Catalysts are substances that lower the activation energy of a specific reaction by providing an alternate reaction pathway. Catalysts participate in a reaction, but are not permanently changed in the process, as they are regenerated to their original state. Many scientists classify catalysts into one of three categories: homogeneous catalysts, heterogeneous catalysts, and biological catalysts (enzymes). A homogeneous catalyst is any catalyst that is present in the same phase as the reactant molecules. There are numerous examples of homogeneous catalysts, and we will examine one that is commonly used in textbooks. The alkene but-2-ene can exist as one of two isomers: cis where the methyl groups are located on the same side of the double bond, and trans where the methyl groups are located on opposite sides of the double bond (Figure 17.14 “Isomerization of But-2-ene”). To convert (isomerize) between the two structures, the carbon-carbon double bond must be broken and the molecule must rotate. This process has a relatively high activation energy of approximately 264 kJ/mol and is therefore fairly slow to occur at room temperature. But-2-ene can exist as one of two isomers. This diagram shows the isomerization of but-2-ene. A catalyst like iodine can be used to provide an alternate pathway for the reaction with a much lower activation energy of approximately 118 kJ/mol (Figures 17.15 “Catalyzed and Uncatalyzed Reaction Pathways”). Potential energy diagrams of catalyzed and uncatalyzed reaction pathways. In the catalyzed pathway, an iodine atom is generated that reacts with cis-but-2-ene to produce a reaction intermediate that has broken its carbon-carbon double bond and formed a new C-I bond and a radical (Figure 17.16 “But-2-ene Catalyzed Isomerization Steps”). The molecule can rotate more easily and the C-I breaks to reform the double bond. But-2-ene catalyzed isomerization steps using iodine as the catalyst. Heterogeneous catalysts are those that are in a different phase from one or more of the reactants. Commonly solid metals and metal oxides are used to catalyze the reactions of gaseous or liquid reactants. 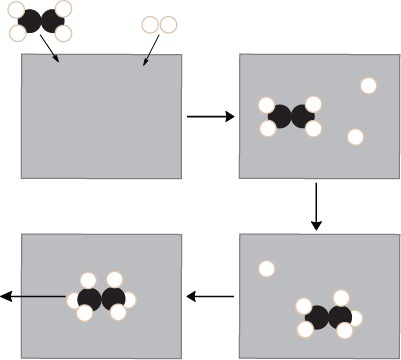 Solid catalysts often serve as a surface on which reactions can occur, where one or more reactants will adsorb (bind to the surface) to the solid. A common example of heterogeneous catalysis is the hydrogenation reaction of simple alkenes. The conversion of ethene (C2H4) to ethane (C2H6) can be performed with hydrogen gas in the presence of a metal catalyst such as palladium (Figure 17.17 “Conversion of Ethene to Ethane with Hydrogen and a Metal Catalyst”). Ethene and hydrogen adsorb onto the metal surface, where the H2 breaks into two individual hydrogen atoms bonded to the metal surface. A reaction occurs between adjacent ethene and hydrogen atoms on the metal surface, first to generate a C2H5 intermediate, then to generate ethane, C2H6, which desorbs from the surface. Catalysts within living things facilitate the vast and intricate system of chemical reactions required for life. There are two main types of naturally occurring catalytic biomolecules: ribozymes and enzymes. Ribozymes are ribonucleic acid (RNA) molecules capable of catalyzing certain chemical reactions. Ribozymes are a relatively recent discovery, first reported in 1982, but their importance was demonstrated by the awarding of the 1989 Nobel Prize to the discoverers Sidney Altman and Thomas Cech. Research is ongoing to better understand these catalysts and develop new therapeutics and medicines using them. Enzymes are protein molecules that catalyze biochemical reactions. They are remarkably specific for the reactants they can use, known as substrates, and many dramatically increase reaction rate by factors of 107 to 1014. A simple model often used to describe enzyme activity is known as the lock-and-key model (Figure 17.18 “Lock-and-Key Model of Enzymatic Catalysis”). In this model, enzymes accelerate reactions by providing a tight-fitting area, known as the active site, where substrate molecules can react. Hydrophobicity and intermolecular forces such as hydrogen bonding, London-dispersion forces, and dipole-dipole interactions facilitate the binding of substrate molecules to the active site, forming an enzyme-substrate complex. When the reaction is completed at the active site, the product is released. Lock-and-key model of enzymatic catalysis showing the tight-fitting area where substrate molecules react. Catalysts provide an alternate, lower-energy reaction pathway. A homogeneous catalyst is any catalyst that is present in the same phase as the reactant molecules. Heterogeneous catalysts are in a different phase from one or more of the reactants, and often act as a surface on which the reaction can occur. According to the lock-and-key model, enzymes accelerate reactions by providing a tight-fitting area, where substrate molecules can react. Catalysis by Jessie A. Key is licensed under a Creative Commons Attribution 4.0 International License, except where otherwise noted.